Talia was two years old when she made aliyah to Ra’anana, Israel from Houston, Texas, in United States. During primary and middle school, she was educated in the Tali program, a non-religious track for enhanced Jewish studies in the Israeli public school system. Talia studied for her bat mitzvah with Susie Dvoskin, who had an important influence on Talia to pursue egalitarian Jewish prayer. Talia is a regular Torah and Haftorah reader at Kehillat Hod Vehadar, also leading prayers for this conservative/masorti synagogue in Kfar Saba. For several years, Talia was a counselor in the Ra’anana branch of the Noam youth movement, which is the scouts program for the Masorti Movement for conservative Jews. She now heads the program to teach Ra’anana counselors in training. 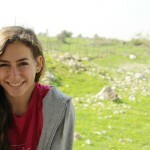 As of this writing, Talia is completing high school at Ostrovsky High School in Ra’anana, studying chemistry and art. She will be attending the Lachish pre-army mechina educational program in Nahal Oz. “Susie has been a core influence on my Jewish studies over the years. I am proud to be a contributor to this important project.” comments Talia on her collaborations with Susie both for her bat mitzvah and this website development initiative.